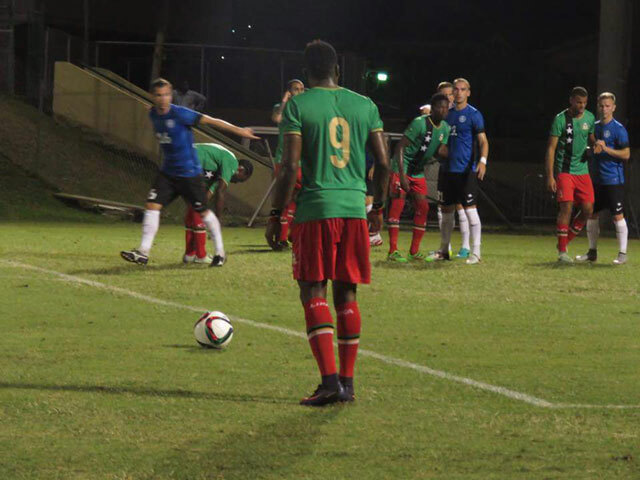 Basseterre, St. Kitts– St. Kitts and Nevis Senior Men’s football team put their disappointment of failing to beat Haiti and Qualifying for the CONCACAF Gold Cup behind them as they drew 1-1 in an international friendly versus Estonia at Warner Park on Saturday evening. With the FIFA scheduled international break completed and the professional players returning to their respective clubs the Sugar Boyz used the opportunity to give some much needed experience to some locally based players as well as some U-20 players who are in preparation for the CONCACAF tournament in 2017. The Estonians coming off an 8-1 drubbing by the hands of Belgium looked the more relaxed of the teams as they looked accomplished passing and keeping the ball and looked very dangerous early on but the home side managed to weather that storm. However in the tenth minute Kimaree Rogers of St. Kitts and Nevis was brought down just outside the 18 yards box and won a free kick. Stepping up for the free kick was Devaughn Elliot whose left footed strike deflected off an Estonian defender and found itself in the back of the net to give the home side a 1-0 lead. After taking the lead St. Kitts and Nevis seemed to revert to a more defensive style of play as the visitors enjoyed most of the possession but were restricted in creating clear cut goal scoring opportunities. However three minutes before half time Estonia finally made their possession count as a stroke from Rauno Sappinen left the SKN goalkeeper with no chance of saving and bringing the game back on level terms. St. Kitts and Nevis coach Jeffrey Hazel speaking after the game indicated that he thought the team executed their game plan. Hazel also commented on the young players who were given opportunities in the game. Estonia Head coach Martin Reim following the game hailed the St. Kitts and Nevis players as “very fast and strong” and indicated the conditions were difficult for his side who needed two water breaks during the game.